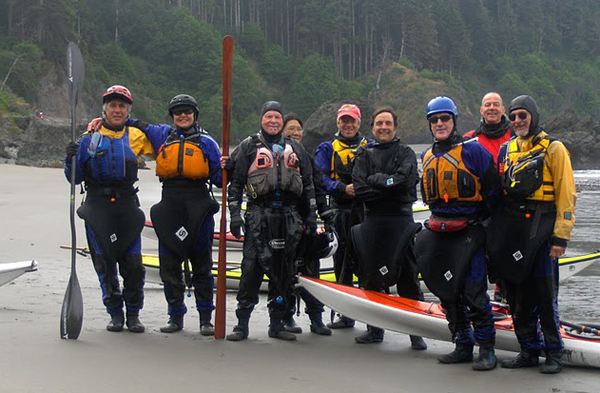 Explore North Coast is an association of paddlers that holds regular paddling events, promotes paddling safety and education, and encourages stewardship of, and improvements to, bay and coastal access on the North Coast. We are an American Canoe Association (ACA) Paddle America Club. We have about 100 members who participate in all forms of sea kayaking, including touring, surf kayaking and flat-water recreational kayaking. All ages and skill levels are welcome. We take advantage of the many beautiful areas of the North Coast that are accessible by kayak. These include Humboldt Bay and its many sloughs, the coastal lagoons, Trinidad Harbor, and the wild and unpredictable Pacific Ocean. We are as different as people can be, but we have two things in common: we love kayaking, and we are happy that we can do it here. Come join us! 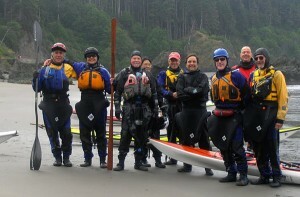 Explore North Coast is a volunteer kayaking club. We are not an outfitter, a school or any other professional or commercial enterprise. Our activities are organized, led and taught by volunteers. While we have members who have many years of experience and who are very skilled, their willingness to share their skill is non-professional and entirely voluntary. Kayaking is an inherently dangerous activity. Injury and even death are possible. You, and you alone, are responsible for your own safety, for knowing your own skills and limitations and for appraising the conditions present and forecasted for any paddling event. We do not share that responsibility with you. While we attempt to operate as safely as possible, it is not possible to eliminate the risk inherent in kayaking. Use your own judgment and never follow anyone into a situation you are unsure about. Different paddles may require different equipment. Every participant is required to wear a securely fastened PFD (Personal Flotation Device) on each paddle, regardless of conditions. There are no exceptions. The trip host is not a guide. They are no more responsible for your safety than anyone else in the group. They have no duty to evaluate your skills for a trip. That is your responsibility. They may, however, eliminate anyone they feel is unprepared for the trip or the conditions. Remember, however, that conditions can change quickly and you alone are responsible for your safety. Click here to email the Board.